These pumpkin spiced cocktail nuts are perfect for fall parties or as an easy to prepare snack! How much can you really say about cocktail nuts? They’re tasty and they have a silly name. Seriously, though, you guys are going to love my nuts! These pumpkin spiced cocktail nuts are perfect for fall and holiday parties. Put them out at Thanksgiving as a snack while people are getting their drink on! I decided not to go overly sweet or spicy with the recipe but you can adjust the spice quantities to taste. 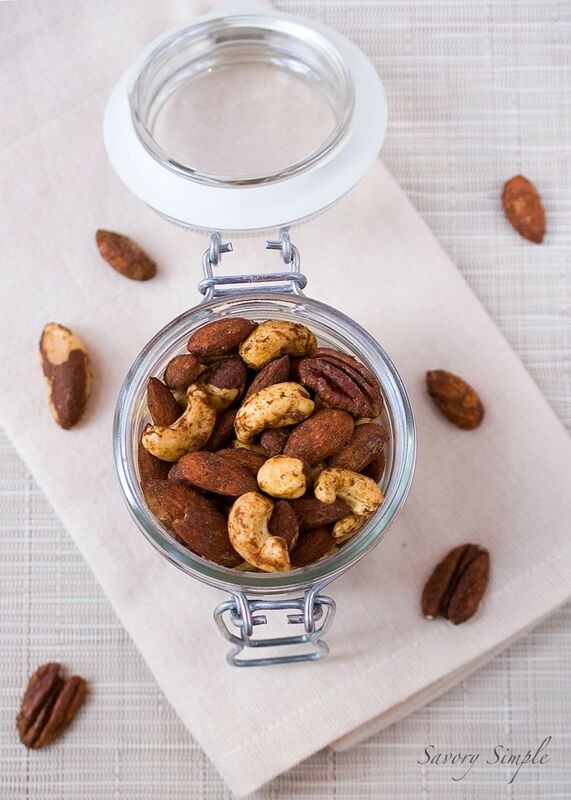 A bit more maple syrup, a bit of cayenne pepper… customize your nuts! I used Trader Joe’s Fancy Mixed Nuts, which are a combination of cashews, almonds, pecans, brazil nuts and filberts. In my opinion, the pecans and cashews were the most addicting but this will work with any combination of nuts. I also used Penzy’s Pumpkin Pie Spice but you can easily make your own fall spice mixture from ingredients such as cinnamon, fresh nutmeg and allspice. Enjoy! Preheat the oven to 250 degrees F. Line a baking sheet with parchment. Place the nuts in a large bowl. In a smaller bowl, whisk the egg white and maple syrup until frothy. Pour the mixture over the nuts and stir until the nuts are well coated. Sprinkle the spices over the nuts and toss until evenly combined. Spread the nuts on the parchment in a single layer. Bake for 45 minutes, allow to cool before serving. You can easily make your own! There are tons of recipes online. It’s usually a mixture of cinnamon, nutmeg, allspice and maybe cloves. I love these. My paternal grandparents always had bowls of cocktail nuts in the living room, so these brought back some memories. If only they could have tried them this way! My grandparents did the same thing! A bowl of nuts and a bowl of candy every time. I absolutely adore spiced nuts and make the for Christmas gifts each year. This twist looks so good and perfect for an autumn snack with a glass of apple cider! I’m ready to jump for joy with excitement now that it’s finally here! Love the idea of using pumpkin pie spice! Yum!! 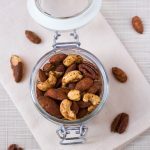 I love spiced nuts as the weather gets cooler and around the holidays! I’ve never tried pumpkin spiced though but you know how much I love pumpkin! So happy you made these.. my mom would love this recipe! I love spiced nuts! These are a great fall party appetizer! This sounds super tasty! What a great twist for something I’ve always thought was kind of boring – perfect for company! I think if I make these, I am going to weigh 54735 pounds. I’m ADDICTED to stuff like this! Nuts, chips & dip… if you put it out at a party, I’m eating it the whole time, haha. And pumpkin spiced nuts?? Does it get any cooler than that!? Yum! What a great idea! Perfect for Fall.